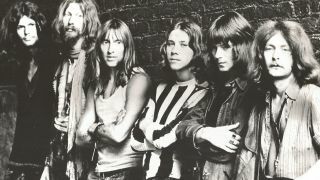 Hawkwind have confirmed that their former synth player and keyboardist Michael ‘DikMik’ Davies has died. Davies was brought into the band by his friend and band leader Dave Brock shortly after Hawkwind’s formation in 1969. He played on the band’s self-titled 1970 album and also appeared on 1971’s In Search Of Space and 1972’s Doremi Fasol Latido before leaving in 1973. Hawkwind issued a statement which reads: “We are very sad to let you know that our old friend and band mate DikMik, Michael Davies, passed away early this morning. Brock has also offered his own tribute, saying: “I remember when DikMik joined the band – he bought himself an audio generator from Tottenham Court Road, got himself a Watkins Copycat echo unit, a fold up card table – complete with green baize – and became one of the innovators of electronic music.